The Lurkers Beneath Lake Fear! Dragon is held captive aboard the Martian flying saucer where he witnesses CyberFace’s visage appear in this vessel just as it had done the previous time they clashed. He explains how he can project his mind into various locations and now transforms the interior of the craft into numerous weapons. The guns open fire on Dragon who uses them to break free of his restraints. He then punches his way out of the spaceship and leaps out above Lake Michigan. The huge fleet of flying saucers provide Dragon with stepping stones for him to bounce off of as he gets closer to the lake. He lands in the water hard and has the wind knocked out of him, causing Dragon to have to return the surface for some air. The flying saucers immediately catch sight of him and open fire, forcing him down into the depths. A number of probes are fired into Lake Michigan to search out their quarry but they are soon destroyed. Several of the spaceships are merged into a large robot that enters the water and its weapons threaten Dragon’s life more than the probes had done. He stirs up a large amount of mud to block out the sensors of his opponent but is forced back up for some more air. Dragon begins to recognise his surroundings and notes that the flying saucer found in his reality beneath Lake Michigan should be nearby unless it was discovered on this Earth earlier than on his own. Dragon swims as fast as he can to the dormant vehicle and reaches it mere moments before the robot catches up to him. It lifts up the flying saucer only for it to explode, tearing the robot apart but Dragon swims away, using the explosion as a distraction and hoping that he will be assumed killed. A spacesuit had been recovered from the Martian ship and he is finally able to breathe properly without having to risk exposure by returning to the surface. It is deemed too dangerous for Dragon to return to Chicago as CyberFace will be hunting for him there so he reasons that it would be sensible to swim all the way up to Canada. 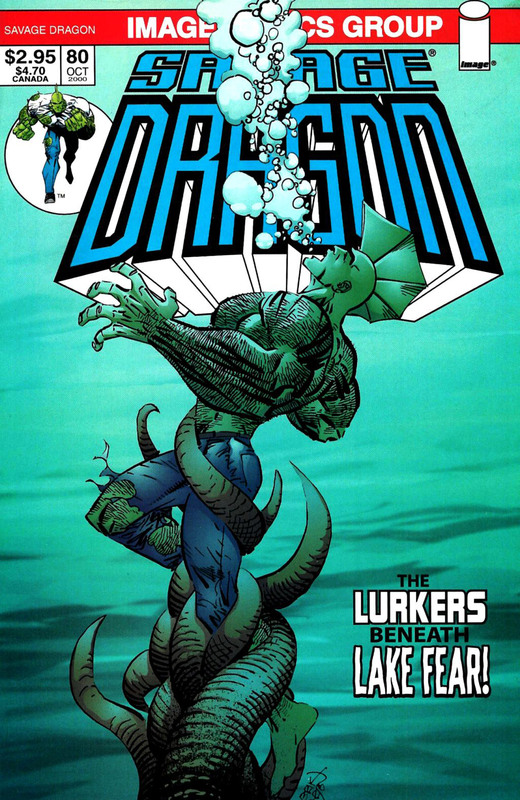 As Dragon reaches open water he notices the same giant sea monster that Hellboy and he had once encountered. He tries to swim away as fast as possible but the monster has soon caught up and is about to swallow him when CyberFace’s robot arrives, having repaired itself into a working state once more. It soon shoots the monster dead whilst simultaneously launching a more deadly model of probe after Dragon. These probes come equipped with weapons and one of them hits Dragon’s spacesuit helmet which takes away almost all of his air supply. He desperately tries to get to the surface whilst also avoiding further hits but a different predator is the one to get him. Dragon is dragged into a tunnel which leaves CyberFace enraged; he looks on through his robot proxy and declares that his nemesis cannot hide from him again and that he will finally eliminate him.